WASHINGTON, D.C. - A coalition of leaders representing health, taxpayer, student, faith, and environmental groups dumped one ton of coal on the U.S. Capitol lawn May 15th to protest the multi-billion dollar subsidies proposed for the fossil fuel industry under the national energy bill now before the U.S. Senate. The legislation would harm taxpayers, accelerate CCAN Director Mike Tidwell denounces the "dirty" national energy bill as a disaster for the global climate global warming, and worsen the federal budget deficit while doing absolutely nothing to promote national energy security, according to industry analysts and advocates speaking at a press conference in the "Upper Senate Park" just a few hundred feet from the Capitol dome. unwarranted and unaffordable giveaway that distorts energy markets and hurts consumers. 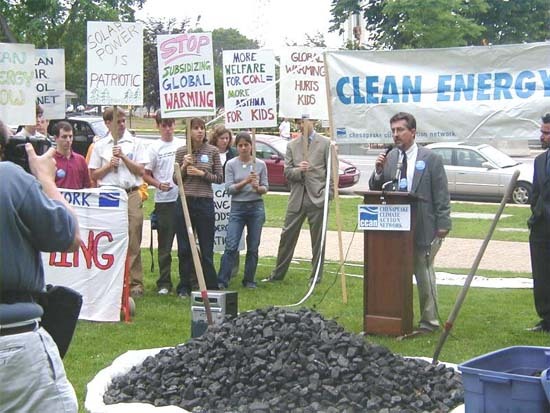 Mike Tidwell, director of CCAN, the sponsoring organization, pointed out that the Senate's "Energy Security Act of 2003," with at least $17.5 billion in corporate giveaways to the oil, coal, and natural gas industry, would incentivize fossil fuel consumption over conservation, thus asking taxpayers to spend money they don't have for the dirtier air and accelerated global warming nobody wants. The five-inch thick Senate bill, like its House counterpart, offers energy-sector giveaways ranging from nanotechnology research to a demonstration project to burn post-consumer carpeting in cement kilns. The Senate bill would also provide $17.5 billion in new subsidies and tax breaks to the oil and gas industry. This includes government aid to begin training workers to build an extensive natural gas pipeline delivering Alaskan gas to the lower 48 states. Another proposal would go further, mandating a guaranteed price for all gas sold from the pipeline at a cost of up to $40 billion to taxpayers. "Unfortunately, the Senate energy bill does everything that Americans do not want," said Erich Pica, senior policy analyst with Friends of the Earth. He continued, "The bill will give more than $4.5 billion to the coal industry, using the deceptive guise of 'clean coal' to allow more carbon dioxide and mercury into our air and water." Such giveaways might be easier to stomach if they actually improved our economy and helped consumers. But even analysts within the oil and gas industry agree that this 768-page bill will do very little to reduce energy prices or increase domestic energy production. By providing unwarranted incentives for more fossil fuel use, the Senate and House bills also contribute to what most climate scientists worldwide now view as the greatest environmental crisis of the 21st century: global climate change. Even the Bush administration, in a major report it delivered to the United Nations last June, explicitly acknowledged that global warming is real and will worsen in the near future, bringing potentially disastrous impacts to our economy and environment. "So the last thing we need is for our tax dollars to accelerate and intensify these impacts," said Tidwell. "But by giving public money to fossil fuel companies, we make it harder for clean energy sources like solar and wind to compete in the marketplace, thus slowing any real solution to the climate crisis." Given the negative impacts on the federal budget, on consumers, and on the environment, the Senate should immediately strip away every last dollar earmarked for the oil, coal, and gas industry, according to Tidwell. If such subsidies can't be removed, the legislation should be voted down for the simple reason that no bill is better than one that makes everything much, much worse. The coal dump was officially permitted by the Capitol Hill police. There were no arrests or acts civil disobedience.